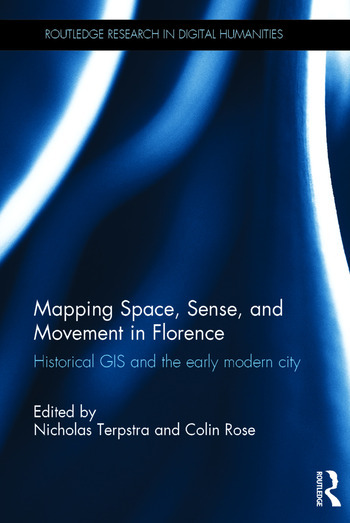 Mapping Space, Sense, and Movement in Florence explores the potential of digital mapping or Historical GIS as a research and teaching tool to enable researchers and students to uncover the spatial, kinetic and sensory dimensions of the early modern city. The exploration focuses on new digital research and mapping projects that engage the rich social, cultural, and artistic life of Florence in particular. One is a new GIS tool known as DECIMA, (Digitally-Encoded Census Information and Mapping Archive), and the other is a smartphone app called Hidden Florence. The international collaborators who have helped build these and other projects address three questions: how such projects can be created when there are typically fewer sources than for modern cities; how they facilitate more collaborative models for historical research into social relations, senses, and emotions; and how they help us interrogate older historical interpretations and create new models of analysis and communication. Four authors examine technical issues around the software programs and manuscripts. Five then describe how GIS can be used to advance and develop existing research projects. Finally, four authors look to the future and consider how digital mapping transforms the communication of research results, and makes it possible to envision new directions in research. This exciting new volume is illustrated throughout with maps, screenshots and diagrams to show the projects at work. It will be essential reading for students and scholars of early modern Italy, the Renaissance and digital humanities. Nicholas Terpstra is Professor of History at the University of Toronto. His recent publications include Cultures of Charity: Women, Politics, and the Reform of Poor Relief in Renaissance Italy (2013) and Religious Refugees in the Early Modern World: An Alternative Interpretation of the Reformation (2015). Colin Rose is a PhD Candidate in the Department of History at the University of Toronto. He has published on petitioning the court in early modern Parma and on vendetta and judicial practice in Bologna. "This volume is one of the first to address the strengths and challenges of digital work focused on the historical data provided by one city. Nicholas Terpstra and his team have developed a model project to show how new technologies can transform and enhance our historical understanding of places and spaces, breaking down traditional divisions between disciplines and forging new capacities to communicate scholarly information." "A highly innovative, fascinating study that will open up new horizons, this groundbreaking book is the first to analyse Renaissance urban history using the powerful tools of digital humanities. This is a highly recommended study, written in non-technical language, of what mapping tools can and cannot do for the study of urban history."